In this day and age, it has been painted loud and clear that videogames have become a widespread epidemic that everyone’s getting in line for. With interactive entertainment becoming more affordable, it is becoming quite common for each family to have at least a single console in their household along with their Television. Whether it is a handheld or a console, videogames have been spreading and feeding on our desire to simulate our ideas to a palpable form of art and entertainment. The latest wave of gaming consoles to hit our local retail shelves are Sony’s PlayStation 3 and Microsoft’s Xbox 360. While these two push the limits of graphic capability for a console, the lovable Nintendo Wii that has pushed on human interactivity in gaming. Gaming technologies continue to have the potential to keep advancing and impressing us. But what is in store for the PC will once again dominate all gaming consoles. Three Dimensional PC gaming has been introduced, once again, as the next advancement for this generation’s gamers to take bliss in. Although 3D gaming has been mentioned over and over, this might truly be the year where it becomes widespread. At Nvision 08 I was able to sit down and enjoy a few upcoming PC games. Out of the five game demos available at Nvision, I was able to test out a few: Grid, Spore, and Unreal Tournament 3. I can safely say that playing a shooter in 3D was an experience I will not forget. A whole new rush comes over a gamer when he or she jumps into an online shooter match in 3 Dimensions. It is quite exciting to experience and see the depth of bullets now literally flying by or the narrowness of halls closing in. Having a chance to play these games in 3D offers a fresh new experience and allows gamers to feel that they are a part of the game more than ever before. Over 350 titles, which are already on the market, will become available in 3D as the new Nvidia cards begin to roll out. There won’t be any need to wait for updates or patches from developers since the new video card drivers, themselves, will support rendering those games in 3D. 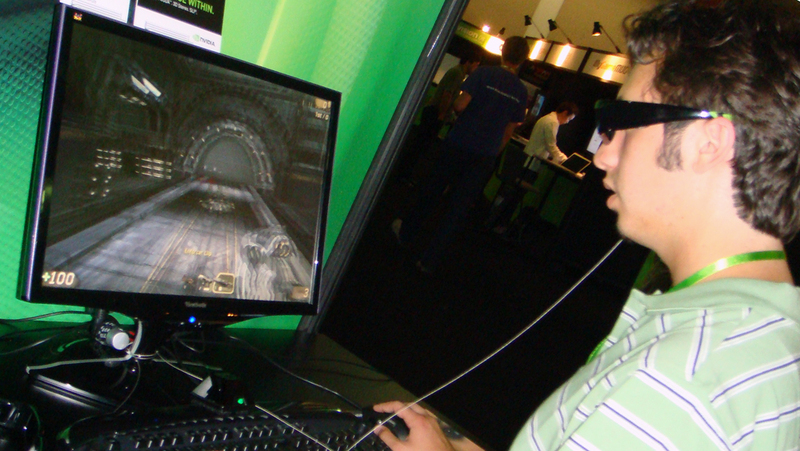 According to Nvidia even GeForce 8 GPUs, which are already widespread, will be able to run those games in 3D. We soon can begin to brag about owning computers capable of rendering games in 3 Dimensions; however I still have to figure out how to explain having to wear those 3D glasses. The NVIDIA GeForce Stereoscopic 3D technology not only opens a 3 Dimensional gaming world that you can dive into, but a sharp and artistic world as well. After all, for all those Unreal Tournament players out there, imagine getting excited about having the Rocket Launcher all over again. The graphics allow for a sharp view of every shot you take, with endless weapons with different capabilities, to be clearly seen in a 3 Dimensional depth now. You can watch the bullet tear through the air and hit the wall that now appears “way out there” and still visually see everything. 3D Gaming has clearly added all new meaning to “diving into an online match” for computer games, but what about other genres of computer games, say one on the other side of the spectrum in this case, say a game that has redefined “a long time coming” gamers, and call it Spore. Playing Spore in 3D, let alone finally, was an amazing and outstanding visual experience above everything else. It truly was able to give you the feeling that you were holding a clay model of your creation, and you could tweak, move, expand, and add to it in any dimensions you wished. Playing this game in 3D, a game that requires a lot of graphical creating that is, gives the illusion that the mouse is able to move in an X-Y-Z plane rather than a boring old 2D plane that reality bounds. Playing Spore also allowed me to understand why it has been taking so very long for this game to arrive. This game, for those who are familiar with Sims, breaks the habit of just being a simulator genre game, and allows you to fully and compulsively create each creature, land, vehicles, weapons, and anything else to your personal artistic desire. I can safely say this game challenges an idea of “infinite gameplay” since you will never be done experimenting. With all this potential for 3D gaming to expand on what we already love and only bring us closer as a part of the whole experience, aside from 350 titles already announced 3D capable, this is generation of videogames on the horizon of great things. Soon we will be able to sit comfortably in our homes, play against friends across the world in a 3 Dimensional experience, and bring ourselves closer and closer to the new wave of entertainment known popularly as Video Games. Despite numerous shortcomings, I maintain that Unreal is the most beautiful FPS ever made. By combining exotic locales with a mesmeric soundtrack, this game feels very much like a vacation rather than the frantic danger and shooting you see in all other FPSs. Yeah, you do have the usual bunch of monsters and weapons (which are kinda impotent and crappy in this game and that was a major shortcoming) but combat is really not that common or frantic and you’ll find yourself saying OOh and AAAh at the environments and levels more often. It isn’t just the graphics but also the very creative and intelligent level design that makes this game so good looking and hypnotic.